Your glass cooktop is often the first surface in your kitchen to experience the thrills—and the spills—of a dinner party, large or small. Render it spick-and-span again using this easy, all-natural approach. Many homeowners invest in glass cooktops because their modern, flat surface makes them both easy on the eye and easy to clean. Or so they think, until they realize that overzealous cleaning techniques and chemical-laden scrubs can damage the pristine finish of their cooktop. Fortunately, you don’t need specialized cleaners or abrasive chemical solvents to solve the messy problem of cooktop spills. Follow this step-by-step tutorial to removed baked-on, caked-on residue from your glass cooktop using only natural ingredients that will maintain the surface’s longevity—and your sanity during the busiest time of the year. Making sure the stove is off and completely cool, gently wipe down the surface. Mix a cleaning solution of hot tap water and dishwashing soap, and then let cleaning rags soak in it. Sprinkle baking soda over the cooktop and then lay the cleaning rags on top, letting them sit for 15 to 30 minutes. Remove the rags and submerge them again in the solution. Then gently wipe the cooktop in circular motions. Soak a dish sponge in cold water and wipe the nonabrasive side over the cooktop to clear away lingering debris. Finish with buffing the top using a microfiber cloth. Continue reading for full instructions on how to clean a glass cooktop. 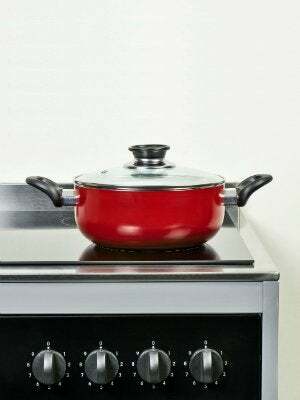 Ensure that the cooktop is set to off and completely cool to the touch. Using a dishcloth or paper towel, gently wipe away any loose debris or liquid from the surface of the cooktop. Do not attempt to buff or scratch off any hard-to-remove grit; leave this stubborn residue to the hardworking homemade cleaner you will prepare later. Put on the rubber gloves so you won’t scald your hands when preparing the cleaning solution. Then, fill a large bowl, bucket, or the kitchen sink (remember to stopper it first!) with hot tap water. To the hot water, add 1 to 2 tablespoons of dishwashing liquid. Mix the dishwashing liquid with the water until the solution is combined and frothy. Submerge the rag or T-shirt in the bowl, bucket, or sink, and allow it to soak up a fair amount of the hot, soapy water. Sprinkle 1 cup of baking soda in a roughly even distribution over the entire surface of the cooktop. Then, remove the wet rag from the cleaning solution and wring out approximately half of the excess moisture with your hands. The rag should be wet but not dripping. Set aside the remaining cleaning solution, but do not discard it. Cover the entire cooktop with the rag(s) or T-shirt, and let it sit for 15 to 30 minutes to allow the baking soda to settle into any stubborn grit on the cooktop. The wet rag will create a moist environment that will prevent the baking soda from drying onto the cooktop. Lift the rag from the cooktop and submerge it once more in the remaining cleaning solution. Remove the rag and again wring out half of the excess water. Finish by gently wiping the rag over the entire cooktop using small, circular motions. 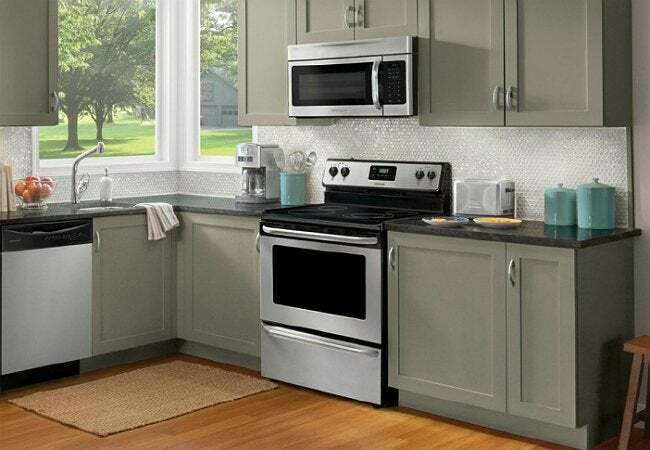 The rag and the baking soda will together act as a gentle scrub, dislodging and sloughing off any debris without damaging the delicate surface of the cooktop. Now that the cleaning solution has done its duty, you can pour the remainder down the drain. Soak a clean dish sponge in cold water, and lightly squeeze out the excess water. Wipe the nonabrasive side of the sponge over the cooktop to clear away any lingering debris or baking soda. When the cooktop is free of residue, use the microfiber cloth to buff the cooktop and give it a sophisticated polish. Work a splash of vinegar into the cloth for a more sparkling, streak-free shine. Now, you’re ready to get cooking for a crowd! Going forward, aim to wipe your glass cooktop after each use rather than at lengthier intervals. This will spare you the extra time and elbow grease of a deep clean and preserve the spotless finish of your cooktop year-round.